The Pre-Feasibility Study into the Augmentation of Water Supply to the Central Area of Namibia and to the Cuvelai area is a strategic national project which aims to examine the nominally feasible options for securing the long term, up to 2050, water supply to the Central Area of Namibia (CAN) and the Cuvelai area of Namibia where existing sources might become inadequate in the near future. This study was initiated by Namibia’s Ministry of Agriculture, Water and Forestry (MAWF), and includes the involvement of the Namibia Water Corporation (NamWater) and the City of Windhoek as major stakeholders. Water consumption has increased steadily in the central areas, driven by population growth and economic development and most of the water sources within the CAN and the Cuvelai have been developed and are nearing the limit of their supply potential. Windhoek already makes use of direct water reclamation and water banking, thereby maximising the use of existing water sources. Further development and growth in both the CAN and the Cuvelai, and by extension in Namibia as a whole, is dependent on securing the long-term water supply for current and prospective future consumers. The development of additional water sources to supply the major demand centres of Namibia is expected to entail major infrastructure development and to be very costly, therefore requiring a thorough analysis of the available alternatives, which is the main aim of this project. Lund Consulting Engineers CC (LCE) has formed a Joint Venture with Seelenbinder Consulting Engineers, incorporating several other experts (both individuals and companies) as sub-consultants in order to undertake this project. Preliminary designs were prepared for the various concept schemes, as well as capital cost estimates. A financial analysis was conducted for the proposed Okavango River – Grootfontein scheme to augment the water supply to the CAN, to determine financial indicators and a break-even tariff. The assessment of the potential environmental and social impacts of the proposed schemes is underway, being undertaken by a separate consultancy team. 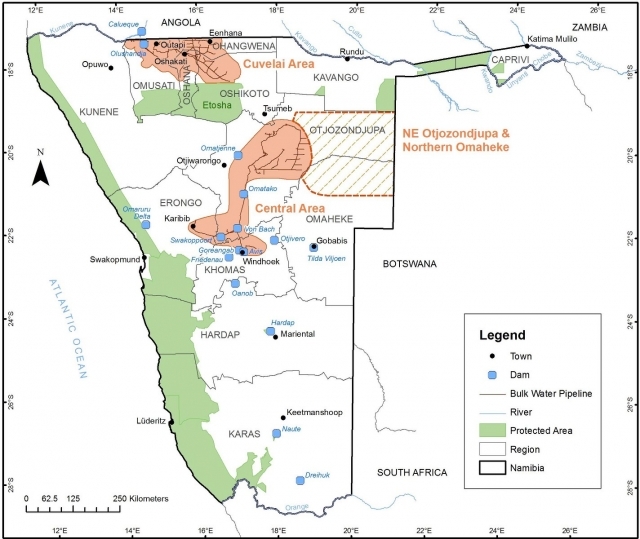 Under Phase 2 of this project, LCE conducted numerical computer modelling of the hydrological and supply / demand dynamics of the Central Area of Namibia, in order to identify the magnitude and likelihood of potential future shortfalls. NamWater’s current CA-Model was used for the numerical modelling and a similar WEAP model was newly developed for the same purpose. A yield analysis for the Kunene River was conducted and the serial and cross correlation of existing and potential water sources (the CAN dams, the Okavango and Kunene Rivers) was assessed, together with drought analyses, to investigate any hydrological correlation between the different sources. Water sources with sufficient capacity to meet these supply shortfalls were identified and concept supply schemes to link the sources and demand nodes put forward. Once appointed to carry out this work, the consultancy team, led by LCE, under Phase 1, assessed the water demands of all existing and potential future consumers in the Cuvelai and Central Area of Namibia, as well as the capacity of existing and potential water sources to these areas. Terms of Reference and an Inception Report into the investigation of alternative water sources for the Central and Cuvelai Areas of Namibia were compiled for the MAWF.